Javier's Dance Studio has been dedicated to its goal of providing dancers with the opportunity to train in an inspirational noncompetitive atmosphere! For 30 years we have offered the finest all-around dance experience designed for Children, Teens & Adults. Javier's Dance Studio has offered a variety of classes instructed by professional and knowledgeable teachers and choreographers. Our staff has provided a friendly and comfortable atmosphere for all. At Javier’s we recognize that the dance experience begins in the classroom but culminates on the stage. Our students have had the chance to to add a new dimensions to their dance training & to grow as a performer. We love to see performance skills grow from great to amazing! Javier Juarez is the Owner/Artistic Director of Javier's Dance Studio, located in Slidell. He has been teaching and performing statewide for the past 32 years. Javier has been a Young Audience Arts in Education program Artist since 1994 and on the Louisiana Artist Roster since 1991. He was the featured artist in St. Tammany Parish Public School 2nd Annual Cultural Connection 2009. Javier was the featured artist of the month in February 2010 for a new program launched by the Tammany Parish Government called artSPARK which features select talented artists living in St. Tammany. He is actively involved in the educational system. Having the arts in the schools is very important to him because he knows how it can make a difference in the students lives. 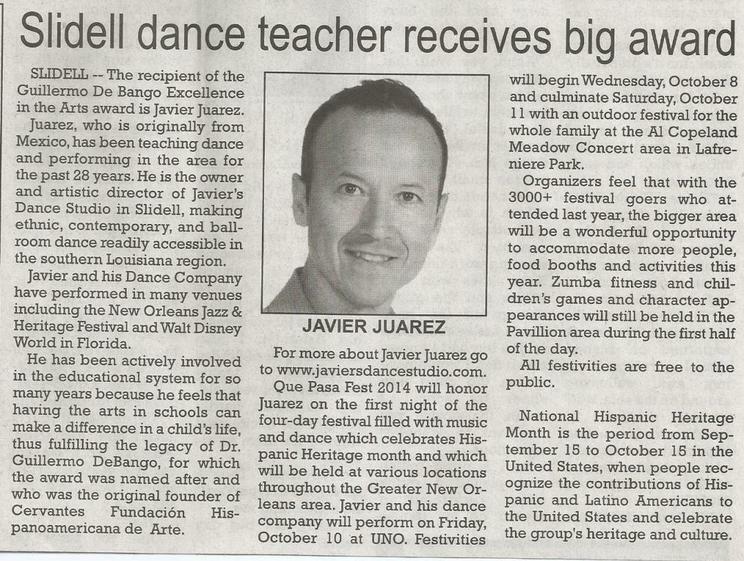 Javier was honored with a Louisiana Division of the Arts 1999 Artist Fellowship for performance in dance. He was selected as Performing Artist of the year 2005 in St. Tammany Parish. Javier and his partner were featured flamenco dancers in Georges Bizet's Carmen presented by the New Orleans Opera in April of 2009. He has been an advisory panelist for the Louisiana State Arts Council. As a panelist, he has had the responsibility and an opportunity to influence the cultural future of the state of Louisiana. Javier is a professional artist endorsed by the Louisiana Touring Artist Directory for artistic merit. He has been on the Louisiana Artist Roster since 1991. Javier has been teaching and performing statewide for the past 30 years. Javier Juarez is the Owner/Artistic Director of Javier’s Dance Studio. He has been teaching and performing for the past 32 years. Javier is also a Resident Dance Instructor for the Jefferson Parish School Ballroom Program. He is the artistic director of Javier’s Dance Company making ethnic, contemporary & ballroom dance readily accessible to the southern Louisiana area. Javier & his Dance Company have performed in many venues, including Georges Bizet’s “Carmen” presented by the New Orleans Opera. The company has also performed many times at the New Orleans Jazz & Heritage Festival and Walt Disney World in Florida. Javier and his troupe have also performed aboard Carnival Cruise Lines Sensation Fun Ship. Javier was honored with a Louisiana Division of the Arts Artist Fellowship for performance in dance. He was selected as Performing Artist of the year 2005 in St. Tammany Parish. Javier has been a Young Audience Arts in Education program Artist since 1994 and on the Louisiana Artist Roster since 1991. Javier was the featured artist of the month in February 2010 for a new program launched by the Tammany Parish Government called artSPARK which features select talented artists living in St. Tammany. Javier has been actively involved in the educational system for the past 28 years. Having the arts in the schools is very important to him because he knows how it can make a difference in a child’s life. 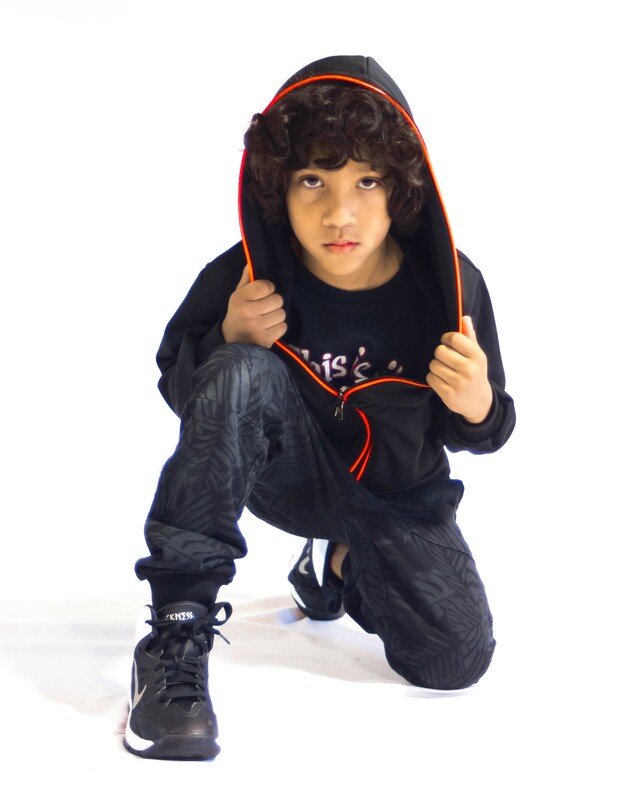 Arian is a young dancer raised by parents that nurtured in him a love of dance and artistic expression. His raw talent and versatile training, combined with his natural knack for performing and choreographing, are an inspiration to his peers. Arian’s unique style fuses hip hop with animation and expressive movements that describe the music he uses. It is his desire share his art form with other dancers, raising the bar for hip-hop performers and performances in the area. He wishes to continue learning and growing in his art form studying the latest dance styles and techniques from some of the best teachers and performers from California to New York.